From America's master storyteller and writer of historical fiction comes the epicstory of the Crown family--first introduced in the New York Times bestsellerHomeland. As the second generation comes of age, the Crowns strive to find theirplace in a turbulent America which stands at the dawn of a new century. From thespeedways of Detroit to the unbridled glamour of a young Hollywood, to the daringheights of early aviation--theirs is a story of passion and adventure, glory, andambition, with all the wonder, promise, and splendor of...American Dreams. John Jakes is the bestselling author of Charleston, the Kent Family Chronicles, the North and South trilogy, On Secret Service, California Gold, Homeland, and American Dreams. 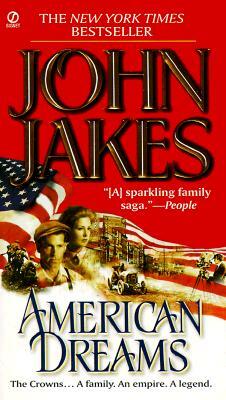 Descended from a soldier of the Virginia Continental Line who fought in the American Revolution, Jakes is one of today s most distinguished authors of historical fiction."